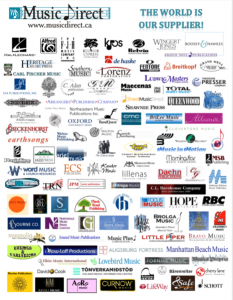 We order from over 100 publishers/providers of band and choir music? It’s true, some of them are shown below. Have a look to see some of the publishers serving music education. And more are added every year. Just ask and we’ll order, from anywhere! Our January promotion is on! Order $250 or more in January and receive a Tim Hortons or Starbucks card as a token of our appreciation. This applies to orders of music (possibly from providers above), reeds, supplies, method books, music folders, or anything off our catalogue (found at https://musicdirectltd.com). If music shopping, our page is a convenient way to source top quality literature for concert band, jazz, and choral (new web update is in the works). Card will be included with your order. We look forward to providing a tasty “Frappucino with chocolate sauce” or bevy of your choice (or lunch) to kick off 2018. As mentioned, a new web update is in the works. Of our two page names, normally musicdirect.ca and musicdirectltd.com have exactly the same content. Until the new page is ready use the familiar page at https://musicdirectltd.com. http://musicdirect.ca is undergoing the new changes, its online but not quite finished yet. After the transition either web name will take you to the new page. We work to be prompt with all publishers but remember our weekly Rush Speed/Regular Price service with the two largest publishers (Hal Leonard and Alfred) is super fast. We place our orders every Friday a.m. and have Alfred arrive (from New York) in one business day, on Monday at 10 a.m. This is the fastest UPS can bring it! Hal Leonard arrives in two business days (from Minnesota) on Tuesday by 6:00 p.m. Super quick for both! No extra charge!